is produced in collaboration with AssociationAdviser.com, a Naylor Publication. 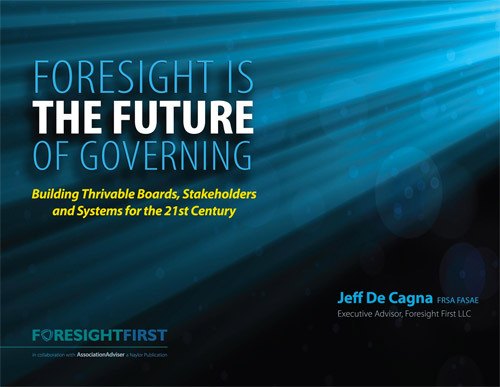 In this provocative eBook, Jeff challenges boards, chief staff executives and other governing contributors to collaborate on creating a different future of governing today. Jeff questions detrimental orthodox beliefs of association governing and argues that societal transformation requires boards to focus their attention on the most critical work of stewardship: understanding, anticipating and preparing for the future through the consistent practice of foresight. To download Foresight is The Future of Governing, please complete the form below. Questions? Please contact Foresight First LLC using online chat! Except where otherwise noted, this site by Foresight First LLC is licensed under a Creative Commons Attribution-NonCommercial-ShareAlike 4.0 International License.